If you’ve ever tried grain-free recipes before, you’ve probably run into some funky textured baked goods. But these?! 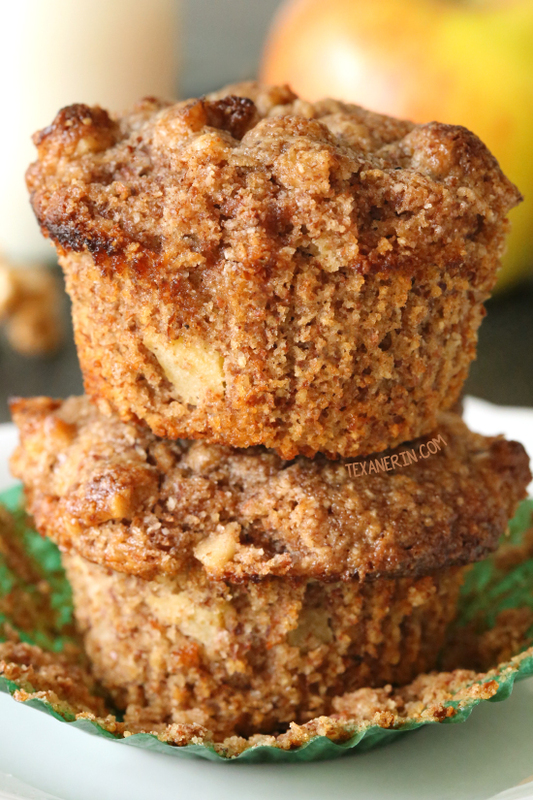 These apple muffins are nice and moist but not at all getting into soggy territory. They’re just perfect. They’re like little grain-free miracles. At first I tried baking these as donuts. The instructions for the apple muffins say to bake at a high temperature first and then lower it. I wasn’t sure if I should do that when making the donuts, but I went with it anyway. That did not work. So if you feel adventurous and want to make these as apple donuts, make sure to bake them at 350°F the entire time! Even though they stuck, they were the best grain-free donuts I’ve ever had. I found this recipe while browsing FoodGawker. This apple muffin recipe comes from Cooking ala Mel. Mel used almond meal in her muffins, which you can find at Trader Joe’s and is a lot cheaper than almond flour. Almond flour and almond meal are the same price over here (only about $4 / pound!) so I used almond flour, which is made up of blanched almonds (unlike almond meal) and is finer ground than almond meal. I got 14 muffins out of this recipe but Mel got 12. I guess I didn’t fill mine as full as I could have, but I was happy with the result! Also, if you prefer a mostly Stevia sweetened version, check out the original recipe. I’m not a big fan of grain-free streusel in general and I think I would have preferred these without the topping but the recipe is there, just in case you want to try. The muffin batter and streusel just seemed to blend together, so it didn’t seem worth the effort. Next time, I’ll just toss some nuts on top. If you ever bake grain-free, you have to try these muffins! And by the way, they don’t taste their best on the first day. They taste good, but not nearly as good as on the second day. It’s kind of odd but I often find this is often true of grain-free goodies! Preheat the oven to 425 degrees F (218 degrees C). Line 14 muffin cups with muffin liners. First, prepare the streusel topping by mixing everything together, except for the pecans, in a small bowl. Add the pecans and stir until well combined. Set aside. In a medium bowl, mix together the dry muffins ingredients (almond flour through nutmeg). In a large bowl, mix together the wet muffins ingredients (eggs through Greek yogurt). Add the dry mix to the wet and stir just until combined! Do not over mix. Fold in the apples. Pour 1/3 cup of batter into each muffin cup. Sprinkle the streusel on top. Bake at 425 degrees F for 5 minutes and then lower the temperature to 350 degrees F (176 degrees C) and for another 8 - 15 minutes or until a toothpick inserted in the middle of a muffin comes out clean. My smaller muffins only needed 8 minutes but larger muffins may need up to 15. Let the muffins cool in the pan for 10 minutes and then remove the muffins to a wire rack to cool completely. These are super moist and need to be kept refrigerated in an airtight container after the first 24 hours. 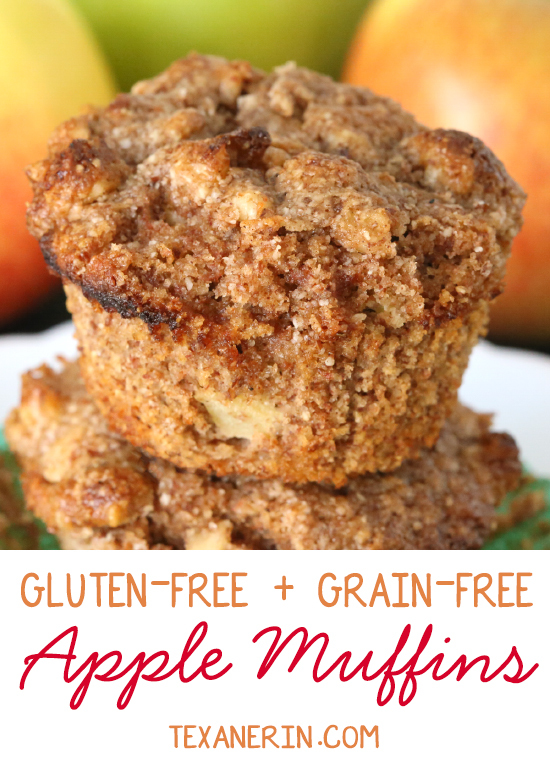 123 comments on “Apple Muffins (grain–free, gluten–free)” — Add one! Just made these, my family and I thought they were really good. Love this recipe! I doubled the recipe and made this in my hamburger bun pans. They turned out like individual coffee cakes. Delicious as written,, however, I needed to change the sweetener for my diabetic hubby. Individual coffee cakes sound amazing! I’ll have to look into hamburger bun pans. Thanks for the tip! I’m so glad you liked them. Can you share what sweetener you used (in case some others are wondering how to make these low-carb)? Thanks a bunch for your feedback and my apologies for my very slow reply! I used Splenda, and adjusted the liquid slightly to make up for not using a liquid sweetener. These muffins are delicious! They turned out perfectly. I decreased the honey a bit and they are still plenty sweet. Erin replies to Susan B.
I’m glad to hear that! And it’s great that they’re still tasty without all the honey. :) Thanks for your feedback and I’m sorry for my very slow reply! Is there anything i can use to replace the eggs? I haven’t had much luck in subbing eggs in these. Sorry about that! I substituted kite hill unsweetened yogurt , and cut the honey to 1-3 d 1-3 monk fruit they were perfectly sweet but not too sweet. Making again and cut honey 1/4 snd monkfruot aloytle mote then 1/3 haven’t tried theyvate in the oven. First batch was amazing! This will be my go-2 recipe! Hi. I’m dairy free at the moment. What can I sub the greek yoghurt with? Hi! Some of the commenters have used coconut milk or cream but I haven’t tried it. Can you sub applesauce for the sliced apples? Unfortunately not. Applesauce is a lot more liquidy and I think the muffins would be soggy.